Signature Border Community sounds from young buck Luke Abbott, with remixes from Gold Panda and Etienne Jaumet. Life-affirming synth workout 'Brazil' appears in its album version - think Cluster by way of Wax Stag. The new 'slow version' brings the 4/4 pulse down to club-friendly tempo without beefing it up unnecessarily, and enhances its trancier aspects, making for a sumptuous club tool that could be equally well deployed in warm-up or peaktime. More importantly, it's just bloody lovely to listen to. 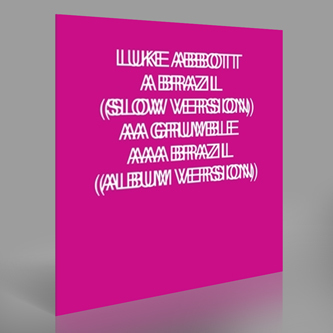 'Grumble''s dam-busting arpeggios border on italo territory, while Gold Panda's elegant 'Brazil' remix has the deep, chiming techno sound of Dial's Lawrence or Pantha Du Prince, and Zombie Zombie's Etienne Jaumet rework of he same track aims for a rarified, firm-pulsed kosmische sound.